Select an option Will you be my...? Thank you for... custom text Such a lucky bride.. Follow Dutchpearl on Instagram and get a 5% discount coupon code! EACH PAIR WILL BE INDIVIDUALLY WRAPPED IN A GIFT BOX. MENTION THE NAMES AT THE CHECKOUT. Each pearl measures in at 7mm. They are handplaced on stamped 925 sterling silver earposts and backings. The pearls are off white/almost ivory. 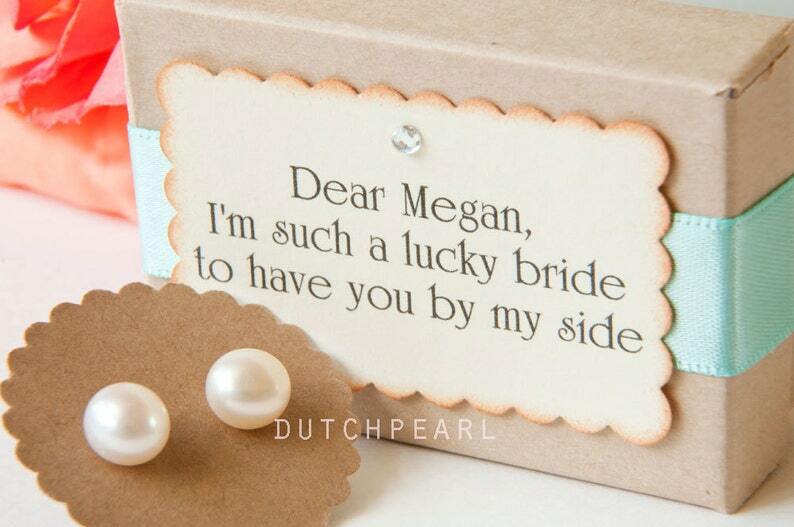 The genuine pearl studs come in a natural gift box, with a personalized scalloped gift tag in ivory. The gift tag has scalloped edges with an antiqued look. Every gift tag is made by myself and a little rhinestone is handplaced in the middle. 1. Dear (name), Will you be my bridesmaid? Is there a maid of honor? Let me know (with the name), I can make this for a maid of honor as well. Do you need more or less? The more you need, the more discount you’ll get (normally $14 each pair). Do you need matching bracelets? 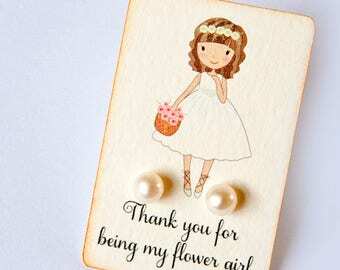 Ideas for Flower Girl Gifts?